I promised you Ta Da’s and here they are. And this is Kim’s Block 2 Ta Da. Send me your Ta Da’s, and I’ll post them. It’s time to get stitching! 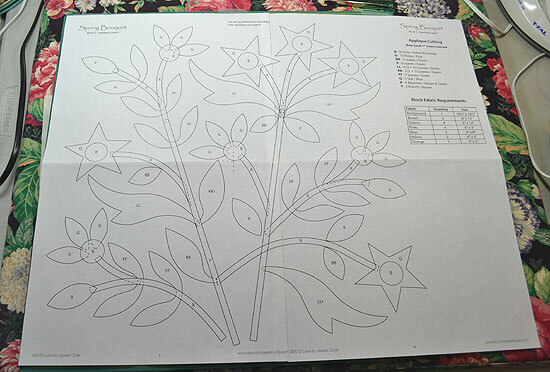 The pattern insert regarding the applique process is on the back of the pattern picture. But most of this information is presuming that you don’t have the already pre-fused and pre-cut Silhouette applique shapes. With these shapes, you do not need to trace, and you can fuse them directly on to your background. On the instructions, this falls in the category of “Fusible Applique”. 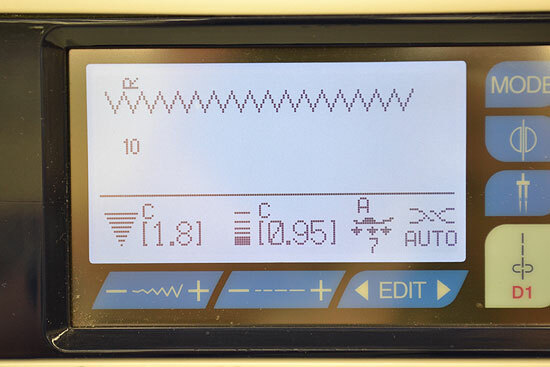 The pattern recommends using invisible nylon thread. If you don’t already know from a previous blog post, I am not a fan of invisible thread. But I’m even less a fan of the “nylon” variety. So if you really want to use invisible thread, I recommend you use the “polyester” variety. Superior makes one called MonoPoly, and Sulky makes one simply called Invisible Thread. We stock both brands in the clear and smoke colours. Since I discovered 100 weight silk thread, I have fallen in love with it. We now stock all the colours of the YLI brand. This is the finest thread we carry. It allows you to do little stitches and fine work that a 50 weight cotton doesn’t do well. And it is as close to invisible as you can get with a fiber. Now, don’t think you’ll need to buy oodles of spools for this project. Being 100 weight, this thread is very fine and takes on the colour to which it is stitched. Matching the value of the thread to the applique piece is more important than an actual exact colour match (much like invisible thread that is also very fine, where you use the smoke for dark pieces and clear for light). I wound bobbins of each of these as well. By using the same weight in the bobbin, I eliminate a lot of the tension problems. 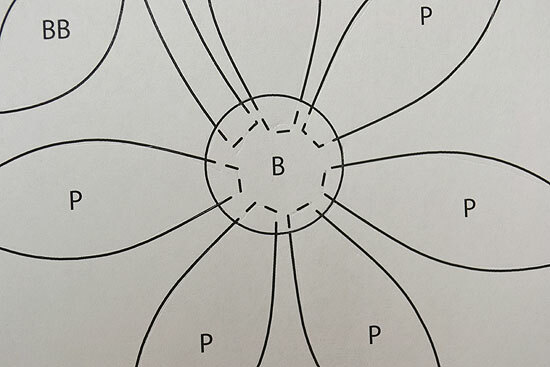 If there are occasions where the bobbin thread rises to the top, you won’t notice it with the same colour in the bobbin (this is more likely on the tight curves of the little yellow circles). You see, I really like to have the fewest possible problems when sewing. And by using matching thread on the bottom, I have nixed some possible stressors. 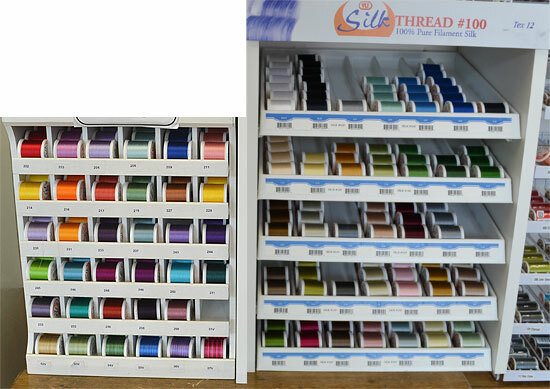 Some people are concerned about the price of silk versus other thread fibers, but I feel in the long run, the benefits much outweigh the costs. Particularly since – drum roll please – I don’t need to use a stabilizer on the bottom when doing a small zigzag with 100 weight silk thread in the top and bottom. Now, you know that stabilizer costs too, and then you have to remove it, hoping you are not pulling out your stitches as you do so. When I am done stitching, I don’t have hours of removing stabilizer afterwards. Here’s a picture of the reverse side of my block. And here is a picture of the front side. Look Ma! No tunneling, puckering, or fabric distortion that can come with heavier threads and a zig-zag or decorative stitch. So let’s talk needles. Size matters. For such a fine thread, you don’t want a needle that will cause a large hole in your fabric. In theory, the space left by the puncture of the needle should be filled with the thread. If I used a 90/14 needle with a 100 weight thread, the hole would be much too big for the thread used. I’d see holes in my work. The type of needle matters, too. As I am working with batiks that have a high thread count (tightly woven), and I want precision work where the needle should penetrate exactly in the spot I want, then I know I want to use a sharp-pointed needle, not a ball-point or even a slightly ball-pointed needle. 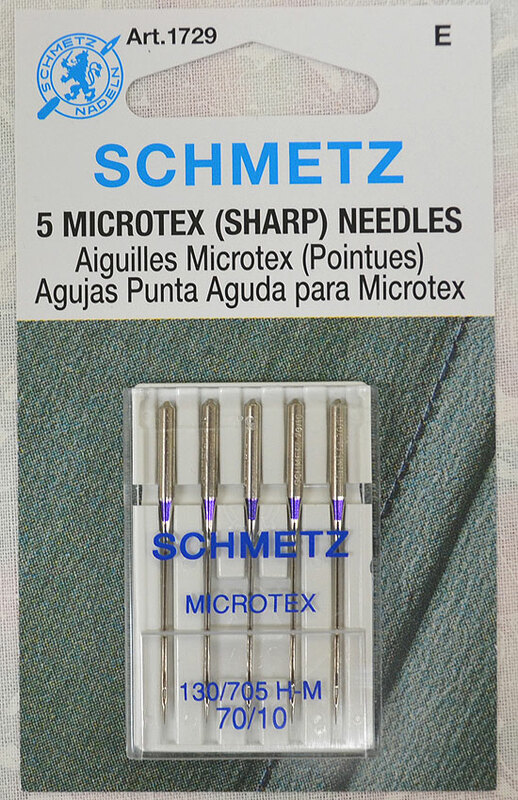 The size and type added up to the perfect selection of a 70/10 Microtex (sharp) needle. I used a small open zig-zag stich. As I am not going to be sleeping under this quilt, there certainly was no need to satin stitch along the edge of the applique. But I did want to make sure my stitch was tight enough that the fabric wouldn’t fray if I washed it. I have an Elna eXcellence 740 and used stitch 10 which is a right swing zig-zag. For most of the stitching, I used a width of 1.8 and a length of .95. I programmed this in with the Personal Setting key (PS), and that is why you see the “C” above these numbers on the screen below. You need to see where you are driving. And sewing, for that matter. So, I used an open-toe satin stitch foot, which is coded F2 for the Elna (or Janome brand). You can sew a lock stitch when you begin and end your stitching. But being slightly paranoid, I lock stitch and sew a few very, very small straight stitches generally right next to the applique piece before beginning and after ending my zig-zag stitching. I hope you can see this on the yellow stitching in the picture below. 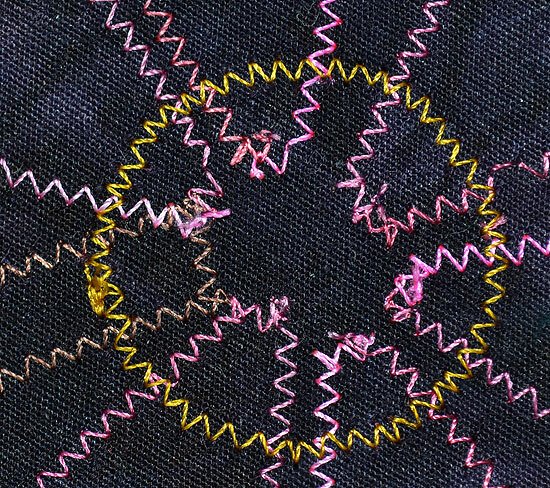 When sewing your zig-zag stitch, the ideal stitch has your right needle swing falling directly beside the edge of your applique piece, and the left needle swing penetrating the applique piece itself. 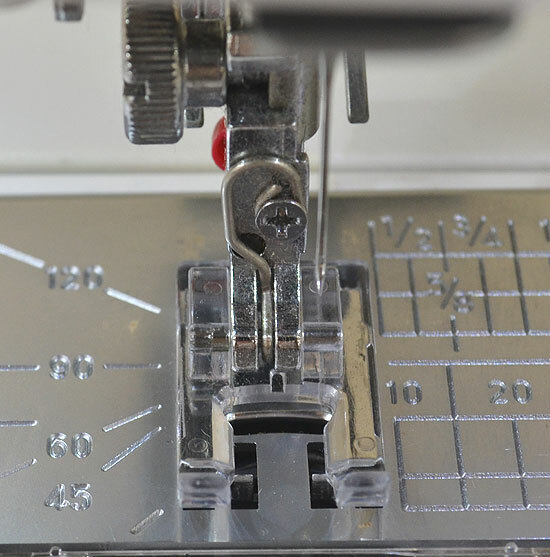 As you stitch, you will need to raise your presser foot repeatedly to pivot, unless you are stitching straight lines. Regular presser foot lifting is a must if you want your stitches to properly cover your curves and allow the fabric to remain flat and not bunch or pucker. 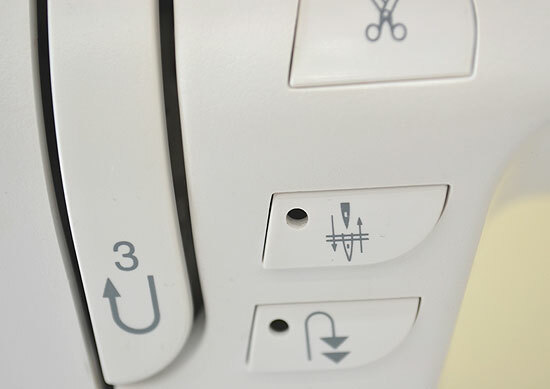 To make this easy, activate the needle down function on your sewing machine if you have it. 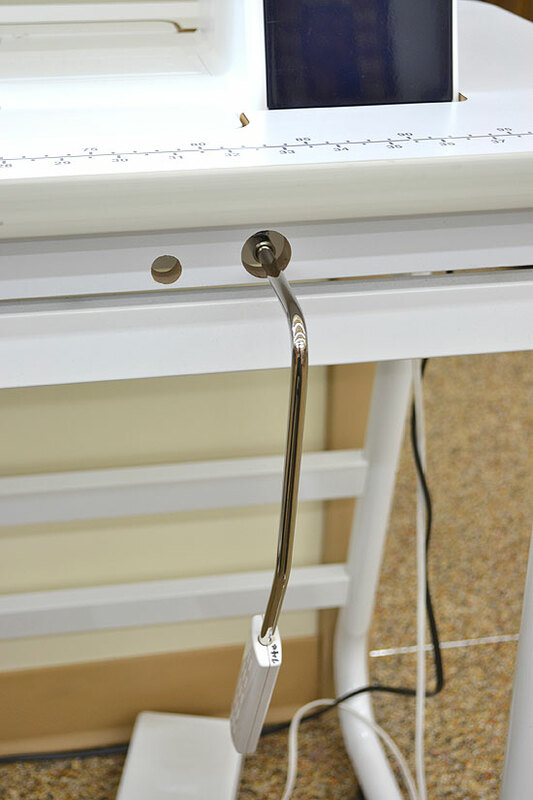 This makes the needle stop in the down position every time you stop sewing, without having to hand wheel the needle into the fabric. And use your knee lift if you have one! It lifts the presser foot, without you having to take your hands off the project. Just a little release of foot pressure with the knee lift is all you need to turn your project. 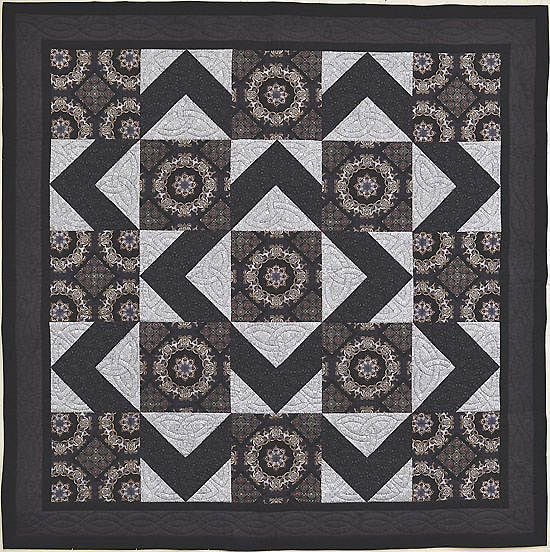 You will find that on convex curves (a quilter’s outie), the best time to pivot is on the right swing of the needle. On concave curves (an innie), the best time to pivot is on the left swing of the needle. Now, get busy with your stitching, and I’ll next post some of my Ta Da’s for this project. So now that you have your design traced on your fabric (or you can use a light box with light-coloured background), you are ready to fuse your applique pieces in place. The pattern does not have an “order of fusing” provided. 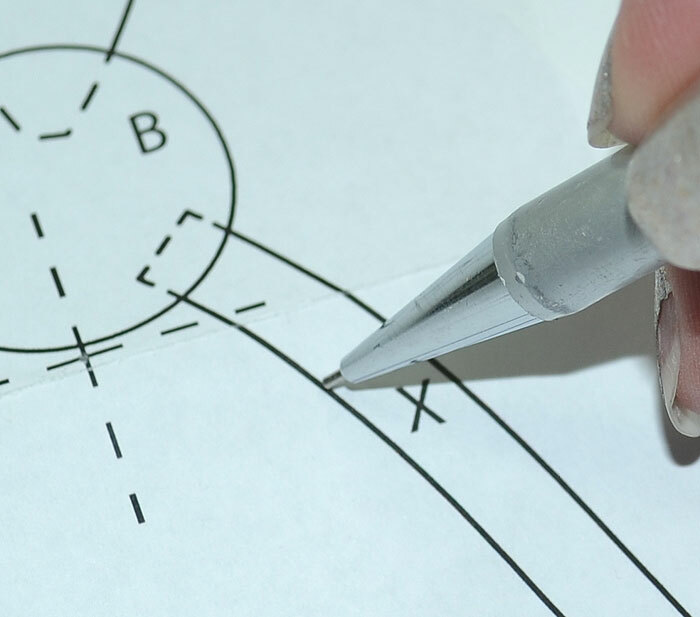 So you need to study the pattern to determine which design elements fit underneath others. The pattern has dotted lines of the pieces that fit underneath others. Leaves that go underneath stems. Other elements that are not underneath anything. Laundry Basket uses the Steam‑a‑Seam 2 product on their Silhouettes. Once you peel off the paper on the back of your Silhouettes, the fusible web is tacky. This web has a slight hold if you press it in place on your background square. I certainly don’t find it has as much “tacky hold” as advertised where you could hold up the block without the applique falling off. However, that may have to do with our very dry environment. In order to increase the tack, you can warm it up a bit in your hand or lightly warm the background fabric with an iron and then press the applique on top. I found that for this project, it was much easier to use a small iron. I used my Clover Mini Iron for most of the time. However, when I wanted to cover a “larger” area, I used a travel-size iron. Laundry Basket recommends on the packaging of the Silhouettes to fuse with a dry iron on the cotton setting for 3 seconds. However, you may need to experiment with your own particular iron. You want to have a long enough duration and temperature combination that the fusible melts, fuses, and stays fused after cooling. After fusing, I checked my edges of the applique pieces, to make sure they were truly fused down. It is rather annoying to be stitching and find the applique piece is loose. You will find that the Silhouette applique pieces do not always completely line up with the design. Occasionally they are a little slimmer or might not be in exactly the same spot. Don’t sweat this. 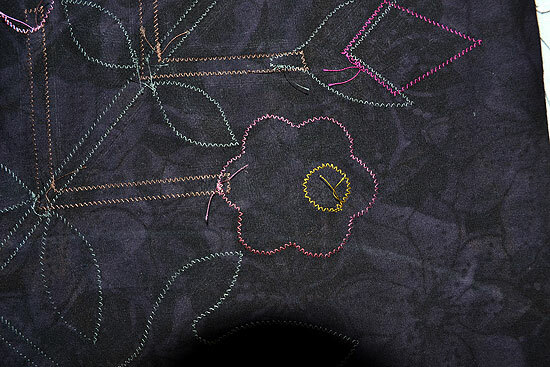 Any lines you drew that don’t get covered with applique can be erased away. Yeah!! 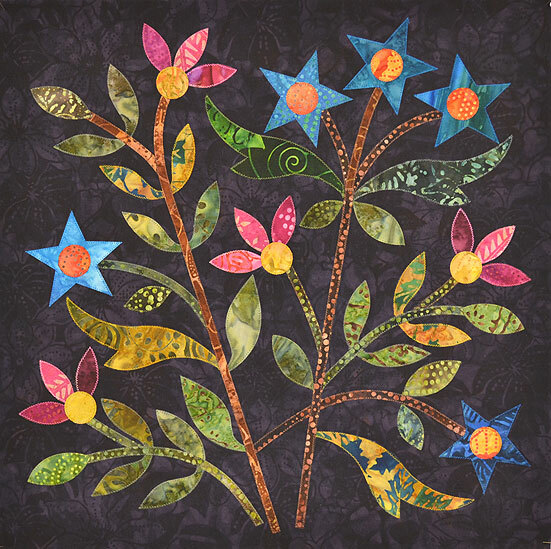 Most people fuse all their applique pieces down and then proceed with their stitching. 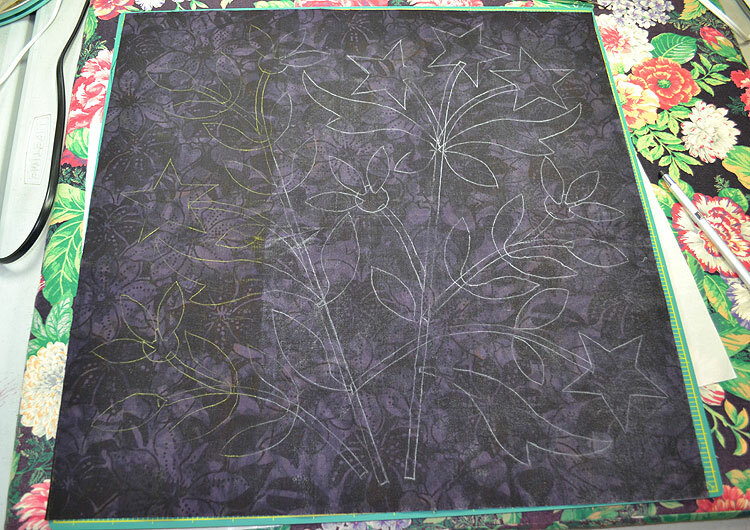 This is much faster, and you can actually have the fusing done for the entire quilt before doing any stitching. This way, if you are stitching with multiple colours of thread, you stitch all the pieces throughout the quilt with that thread. Then you are not always changing the thread, as you would if you worked at completing one block at a time. The next post will be about stitching your Silhouette applique pieces down. 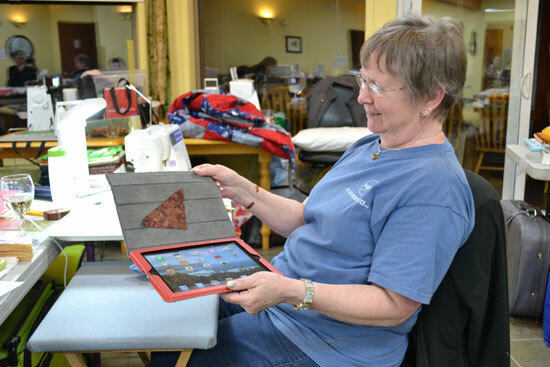 We now know that you can use your iPad cover as a design board for miniatures. Moments like this show just how distracting a retreat can be. You can get involved with everyone’s project, have some munchies, have a laugh at Barb’s jab at Linda C’s pattern interpretation woes, and totally lose focus of what you brought. But wait, what was it that we were there for? Fun, yes, fun, and we had plenty of that. Maybe if I hadn’t laughed so much, I would have got more done. But I did manage to finish a block a day. So I left with having made it part way through Block 5 – the center block, and I am able to share with you some tips on this program. 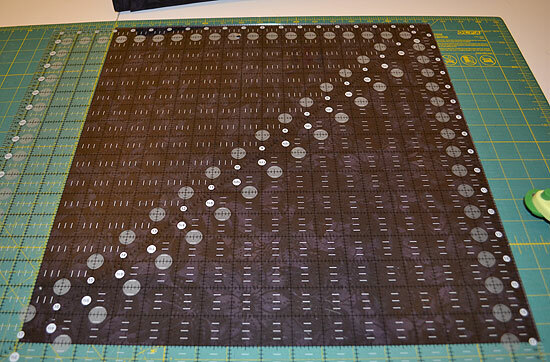 First of all, the pattern recommends you cut your background squares 16 ½”. 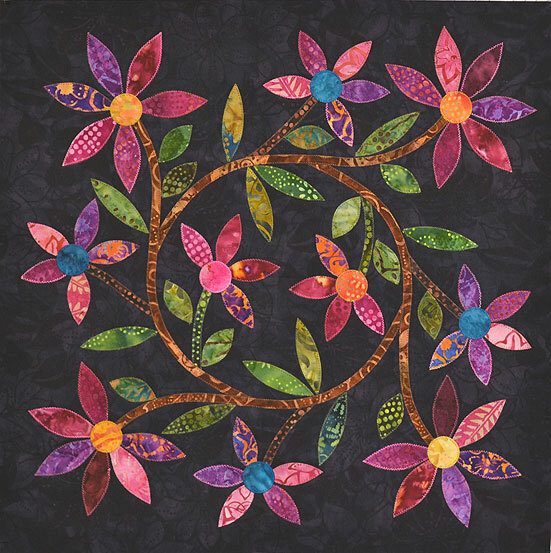 Since the block shrinks a little with the stitching down of the applique pieces, cut your background squares at 17” and then trim them to 16 ½” after the applique stitching is done. 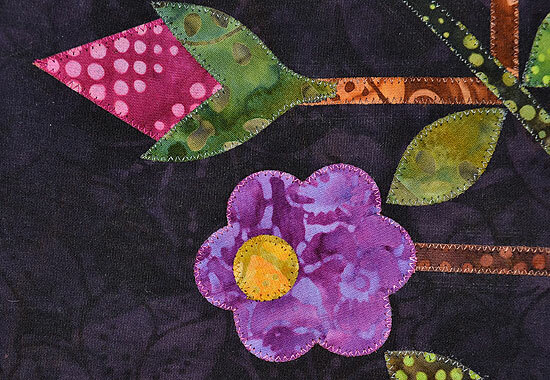 Just make sure when you trim them up to leave a ¼” seam allowance around the applique elements. Each block is 2 pattern sheets. Tape them together with scotch tape. Fold your background square into quarters and crease it in the center both ways. Now, you have to manage the placement of your applique pieces on the fabric. If you have a light-coloured background fabric, you can secure your pattern on a window or a light box and place your background square over it, aligning the center creases to the center registration cross marks on the pattern. 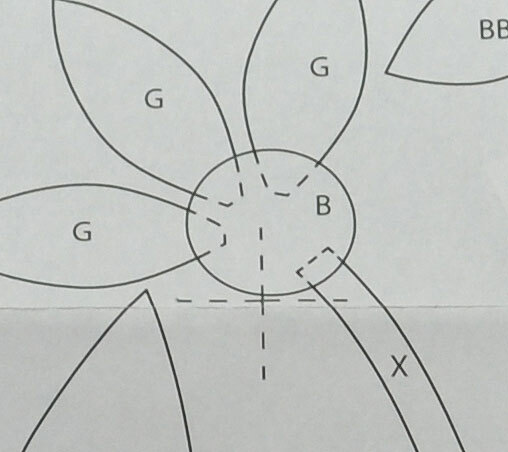 Here’s a picture of the center registration marks on the pattern. Secure the pattern and fabric so they don’t shift. 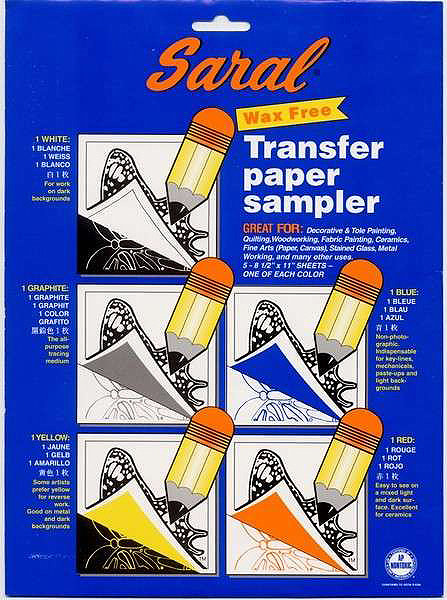 Transfer the design inside the pattern lines with a removable marking pencil (such as an erasable ceramic lead pencil), or work directly on the light box and lightly fuse or press the pieces in place. However, if you have a dark background, you don’t have the advantage of seeing your pattern from behind. So, you will need to transfer the pattern design to your background fabric, using a wax-free transfer paper. I used the Saral brand. Scotch-tape enough light-coloured sheets of Saral Transfer Paper to cover the entire background square. Lay your background square down on a hard, flat working surface, with the right side facing up. With the pattern on top of the fabric, align the center registration marks of the pattern to the crease marks you made on the background square. This will take some peeking underneath the pattern and using a pin to get them lined up. Scotch tape the pattern along the top of the background fabric. 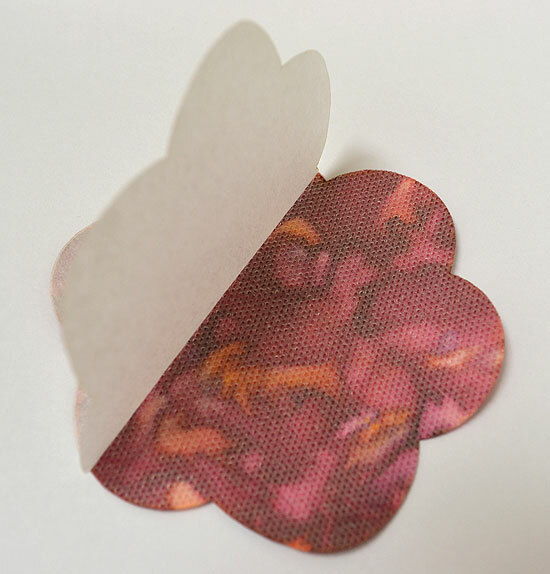 Slide the Saral paper between the pattern and the background square. Make sure the tracing side is facing down on the right side of your background square. This is very important folks, as you can spend a lot of time tracing and not transferring your design at all. Ask me how I know (more than once). Using a stylus, trace just inside the lines of the pattern design. I used a mechanical pencil without the lead for this task. However, subsequent to this, Joanne L. introduced me to the Clover ballpoint awl. It was much smoother to use, and I’ll be sure to purchase one now that we have them in stock. 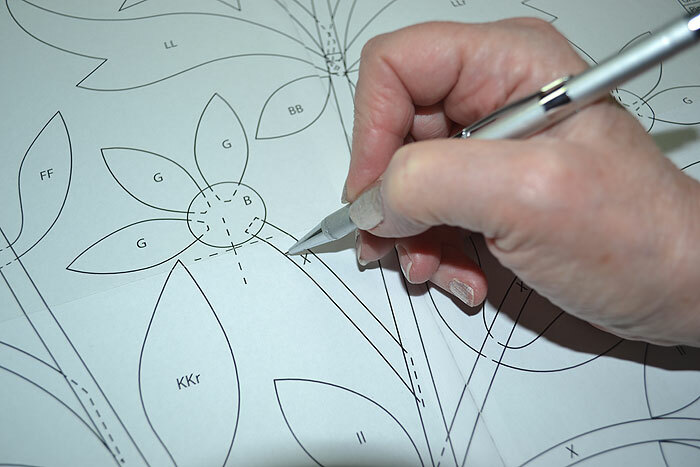 Methodically trace all the lines of the pattern designs, except for the ones you’ll never see once you get the other pieces on top, such as the little circle centers of the flowers. Don’t let yourself get interrupted during this process, or you won’t know where you left off and what part got traced. This is another ask-me-how-I-know bit of advice. And don’t forget to take a sneak peek soon after you start tracing just to make sure you’ve got the correct side down of the Saral paper. Murphy’s law is: If you don’t peek to be sure, it’s bound to be the wrong side down. 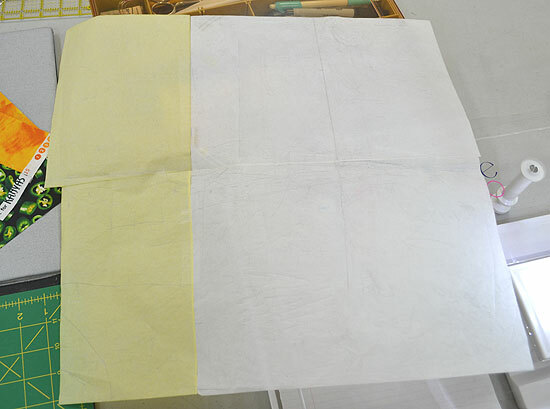 When you are finished, lift up the pattern and Saral paper, and make double-sure you traced it all before you remove the pattern and Saral paper completely. 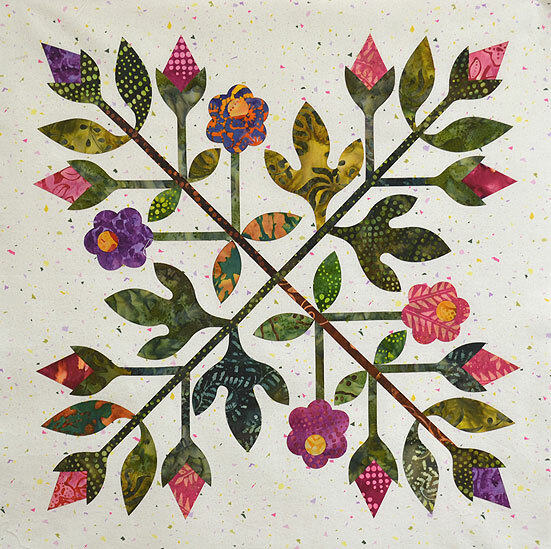 You should now have the design on the front of your background fabric square. The wonderful thing about this transfer paper is if your applique pieces don’t completely cover the tracing lines, they just erase away with a good-quality, clean, white pencil eraser. The lines don’t heat set from the iron. You can see the design, but you don’t have to worry that the lines won’t be easily removed. And now you are ready to fuse your applique pieces down! That will be the next post. In case you thought otherwise, let me admit that quilt shop owners also have Unfinished Projects – even when they are store samples and the kitting of that store sample. 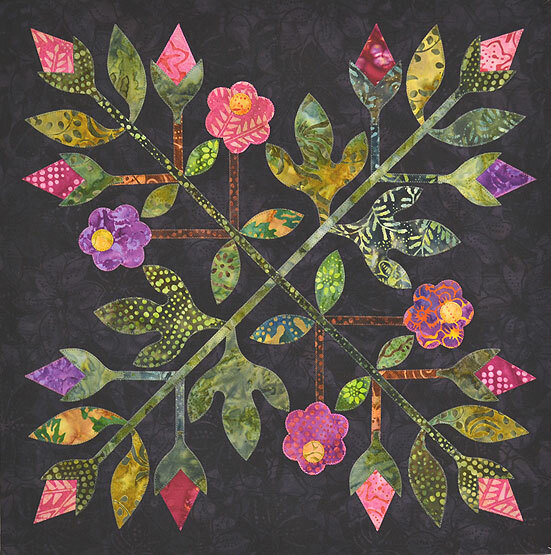 I started the Walk About quilt three years ago, based on an even older line called Gotham by Benartex. I loved the fabric, so I wanted to do the sample personally. It was very quick to make; I worked on it at a North Bow Lodge retreat. 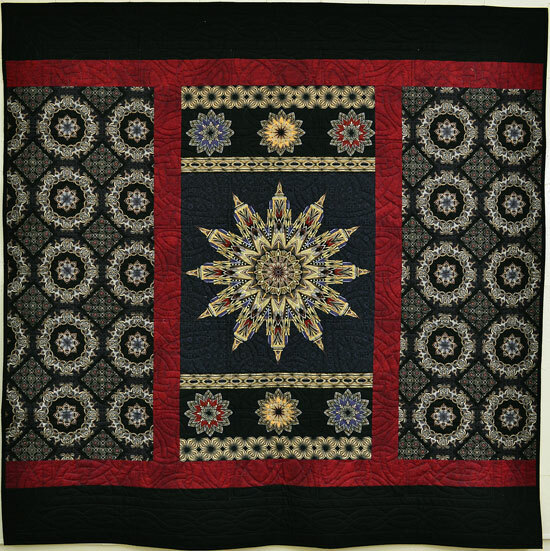 And Jane, who did my quilting, got it finished up pronto too. Then in May 2011, I worked out the kitting requirements. One month later, we moved the store. I then played months of catch-up from the move. After that, other kitting of samples staff had worked on became the priority. Finally, last week I could revisit the project, and Barb just finished cutting and packaging the kits today. The quilt is hung and I feel complete relief. That was a big marble in my jar, even though the project was simple. And a picture of the back, in which I used a panel in the center.